A research guide to inspire and assist with the study of video games within the UCLA community. The UCLA Library houses popular video games, consoles, and accessories for use by students, faculty, and staff. Come and browse the collection in Powell Library's Main Reading Room (2nd floor) or search the Library Catalog to check on the status and availability of a video game. A Bruin Card is required to borrow video games. To check one out, bring the empty display case to Powell's Inquiry Desk. Consoles are available upon request. Below is a selection of games for the Nintendo Wii U console available through the UCLA Library. A list of Wii U games can be found by following this link to the Library Catalog. Angels and demons stand in her way ... punish enemies with elaborate summons; master new moves with Bayonetta's trademark style; utilize new weapons and skills in battle; partner up with a friend online"--Container. "Defy the laws of gravity in the wildest Mario kart game yet. New boomerang, piranha plant, super horn ... optional motion-steering, share highlight reels, 12-player online racing"--Container. Below is a selection of games for the Playstation 3 console available through the UCLA Library. A list of PS3 games can be found by following this link to the Library Catalog. "Final fantasy X: In the world of Spira, join the summoner Yuna in her quest to destroy the monster Sin. Final fantasy X-2: Yuna seeks to resolve various conflicts among factions that are developing as the world of Spira changes." "Bonus content includes all three original sountracks, concept art galleries, an exclusive documentary, game commentaries, PSN avatars, and much more. Also includes FlOw and Flower, and three never before released mini-games"--Container. Below is a selection of games for the Playstation 4 console available through the UCLA Library. A list of PS4 games can be found by following this link to the Library Catalog. "Joel and Ellie, brought together by harsh circumstance, must survive a brutal journey across the US in a dangerous post-pandemic world. Remastered features ... includes additional game content: delve into Ellie's past in Left behind, the single-player prequel chapter, eight new multiplayer maps in the abandoned and reclaimed territories packs, [and] in-game cinematic commentary"--Container. "MLB 14 The Show is a realistic baseball game that allows players to feel the MLB experience with moments such as when you're called up to the majors, a sacrifice fly to left field, or crushing a walk-off homer to win it all." --from www.metacritic.com. Below is a selection of games for the Xbox 360 console available through the UCLA Library. A list of Xbox 360 games can be found by following this link to the Library Catalog. "Dragons, long lost to the passages of the Elder Scrolls, have returned to Tamriel and the future of the Empire hangs in the balance. As Dragonborn, the prophesized hero born with the power of The Voice, you are the only one who can stand amongst them"--Container. "Set far in the future from the original Portal game, awake in the Aperture Science Labs as Chell, a former test subject trying to gain her freedom from the facility and GLaDOS, the AI controller of the facility. In escaping your initial confinement, GLaDOS is also reawakened. Set in the test chambers of the facility, your goal is to make your way through the game levels using your portal gun to create temporary passages through solid surfaces, allowing for creative platforming and multiple possible means of clearing a level." Below is a selection of games for the Xbox One console available through the UCLA Library. A list of Xbox One games can be found by following this link to the Library Catalog. "Recruit legendary warriors to fight by your side as you hunt down agents of chaos and lead the Inquisision. A blast rips a hole in the sky, unleashing an army of demons from the mysterious realm known as the Fade. As the blast's sole survivor, only you and your team can bring the world back from the brink of destruction."--Container. "When a young street hustler, a retired bank robber and a terrifying psychopath find themselves entangled with some of the most frightening and deranged elements of the criminal underworld, the U.S. government and the entertainment industry, they must pull off a series of dangerous heists to survive in a ruthless city in which they can trust nobody, least of all each other."--Container. Want to Find More Stuff? 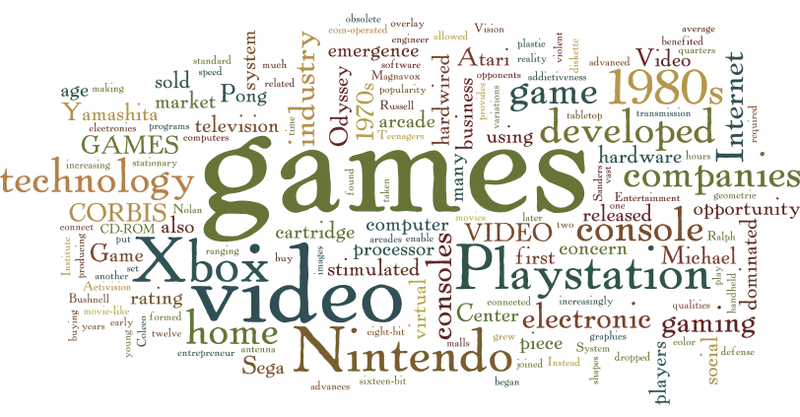 You can search the UCLA Library Catalog by title if you know the name of the game you want. Otherwise, search the catalog under the following subject headings to find more materials.